Bonuses increase on deposit to a maximum of £50. 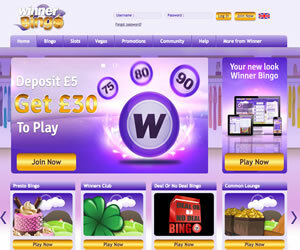 Winner Bingo opened in June 2012 and entered the world of bingo online with a bang, with a bright, vibrant and thoroughly welcoming homepage that is bound to attract new members. Combining flash banners and graphics with a bright interface, the Winner site certainly makes itself known and exudes excitement and fun. Powered by Virtue Fusion, you can be sure Winner offers smooth gameplay and also great quality graphics and instant games. The site claims they're the best place to be if you love bingo and being social. Registering at Winner scores you a fab no deposit bonus, a great additional extra to get you started at the site and the sign up process takes only a few short minutes so you can be in the lobby and playing your favourite games very quickly. The site offers your expected 75, 80 and 90 ball bingo games, with the assumption that as the brand grows more variants will be offered so they can compete with the other brands on the market. The bingo lobby is complemented by a suite casino games, many of which regular players will recognise. These include the hugely popular Clover Rollover mega progressive slot and others such as Thors Thunder and Mafia Millions. The range of casino games is extremely wide and similar to others you find using Virtue Fusion software. 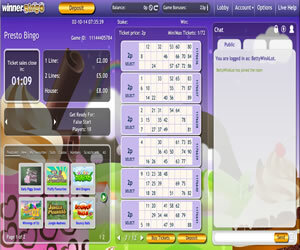 The tabbed toolbar at the top of the Winner Bingo homepage is one of its finest features, as it has absolutely tons of information for players to digest and get their teeth into. Everything from bingo tutorials to a full breakdown of payment methods is fully explained and makes the site seem extremely comprehensive and therefore trustworthy. A closer look at the payment section of the site reveals a standard encrypted banking function which allows for smooth and secure transactions. The only other downfall of the site comes in its excessive use of flash. Although it serves to make the site seem exciting and lively, it does get a bit much as you look through the pages and are constantly met with bright and rapidly moving flash banners. Perhaps limiting these to a shorter run time would make them seem less overpowering and in your face. With the wide range of exciting offers and promotions available at the site, Winner Bingo is certainly entering the bingo world on a high. The promotions on offer are well advertised and easy to locate via the tab bar and aren't limited to deposit specials or welcome bonuses. Their range of standard bingo games is well supported by a large and exciting choice of casino instants and this really makes the site seem worth a shot. Winner Bingo seems like a site that has a little growing to do but it's entered the online bingo community at a time where new sites need to make an impact and it certainly does that. With a no deposit bonus to take advantage of, it's a site that deserves a little time and attention and offers lively gameplay and fun, familiar games. 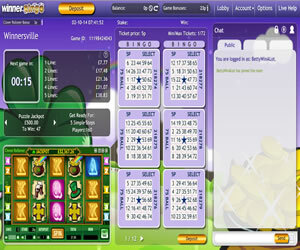 Winner Bingo offers just three variant of the online bingo game at their site; 75 ball, 80 ball and 90 ball games. However, the brand is also home to themed games like Deal or No Deal Bingo. 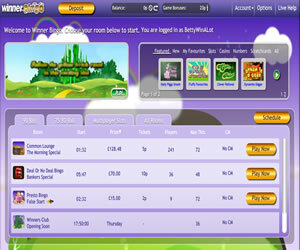 The site also offers the usual suite of instant win games available to play in the same room as your bingo. Four times the Bingo Bonus amount, i.e. £30x4 = £120 , and 20 times the Games and Slots bonus amount, i.e £10x20=£200. This means that you will have to wager at least this amount in order to be eligible to withdraw any of your winnings from the bonus.